What do you do when you go to the grocery store and you see a dozen limes on "clearance" aka a little past their prime, and you buy them because you think...I can make something with these! I decided the juice the limes and make lime curd. I folded the lime curd with some whipped cream and then layered it into a loaf pan with raspberry coulis. I finished the final layer with graham cracker pie crust crumbs but if you wanted to keep this gluten free or just don't like graham crackers, then omit that step., Once the entire thing is frozen, you can slice it and serve it up. I can see myself making this in the summer with other variations on the lime curd. Passion fruit, orange, lemon... yum! Whisk the mixture by hand. Constantly. Do not stop. Keep whisking. The curd will thicken and eventually it will look like the texture of pudding. At the end, put in one drop of green food coloring and stir to blend. (This is an optional step but I like the little tinge of green to remind me that this is LIME curd). Once it has thickened, use oven mitts and transfer top pan/bowl to the counter and whisk in the butter piece by piece. Don't put the butter in all at the same time. You need to let the butter slowly emulsify into the lime mixture. Then, press plastic wrap directly on top of the curd and refrigerate until well chilled and set. In the meantime, whip 2 cups of heavy or whipping cream until soft peaks form. Place plastic wrap over this and put it in the refrigerator until well chilled. Once the whipped cream and curd are both chilled, fold the whipped cream into the lime curd and place into the refrigerator. Make a batch of Raspberry Coulis. We like this recipe from epicurious.com. Line a loaf pan with plastic wrap. Starting with the lime mousse, put about 1.5 cups of lime mousse into the loaf pan and spread evenly. Place this into the freezer to firm up - about 20 minutes. Take it out of the freezer and spread a thin layer of the raspberry coulis. Put it back into the freezer. Keep repeating layers until you reach the top. We did 3 layers of lime mousse and 2 layers of coulis. 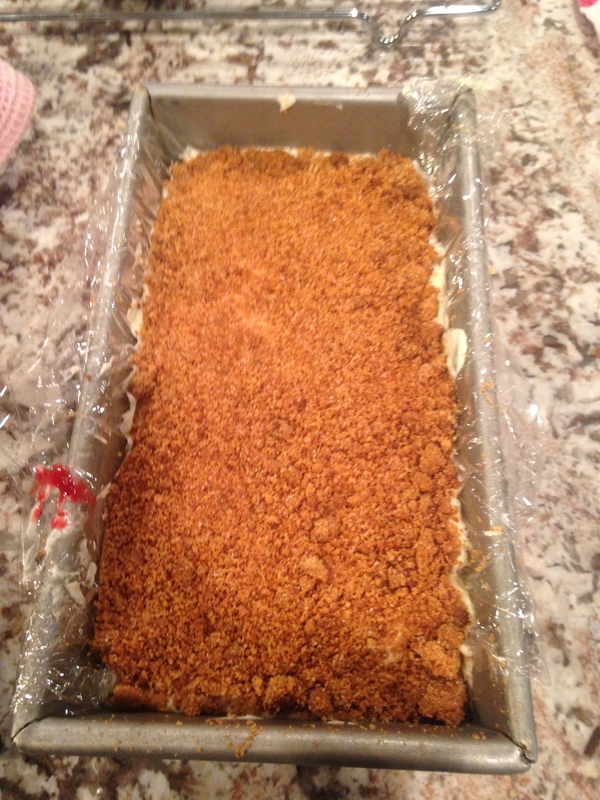 Make a batch of graham cracker pie crust and break it up into crumbs and place on top of the torte. Put it back into the freezer until ready to serve. You will have extra graham cracker pie ccrust which you can put into a container as you can use this for the final plating of the dessert. For the final plating, take the graham cracker piue crust crumbs and make an "X" on the dessert plate. Dip a knife into a cup of hot water and slice the torte. Put the slice in the middle of the "X" on the plate and serve!